I know that the auto policy I have which covers my family includes liability and physical damage for any passenger car that I rent with the same limits and deductibles that I have on my own cars. Chances are, that if you have a standard auto policy with this coverage included for your own car, that you do too. Do you have more than one car insured? If so, the best coverage that you have is what follows you to the car which you rent. If you do not have physical damage coverage on your own car, you must take the coverage offered by the rental car company in order to have coverage for damage to the car you rent. I rented the car and I was the only one driving the car. Your policy only covers you for a car which you rent and you drive. If you are traveling with a friend and want to share the driving duties, neither your policy nor your friend’s policy will cover that exposure. To be covered for multiple drivers that are not included on your auto policy, or to be covered to drive a car which you did not rent, you must take the coverage offered by the rental car agency. I rented a normal passenger vehicle. The car I rented was just your average 4-door car just like I could own myself. If you are renting a vehicle that isn’t something you could own yourself, like a moving truck or a commercial vehicle, you need to arrange for the proper coverage with the rental agency. 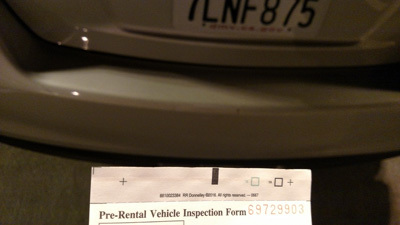 I rented and drove my car within the United States. All insurance policies have a coverage territory defined, and for auto policies that is defined as the USA and Canada. Canada requires a Canadian specific insurance ID card which you must obtain from your insurance agent before your travel, but otherwise any driving within the US is covered. If you are traveling to Europe or anywhere outside of the USA and Canada, you will need to make arrangements to be properly covered wherever you drive. After determining that I would rely on my own insurance there were also a few precautions to take. Before taking my rental car off the lot, I walked around the entire vehicle noting any damage that already existed on the car. Use your cell phone camera to take pictures of any damage you find and use the rental agency’s form to disclose any damage you find. I found a dent on the door and a scratch on the bumper. Know your contract. These days most rental car companies will make you responsible for any new damage to the car, right out of your pocket. You will then have to seek reimbursement from your insurance policy once you return from your trip. 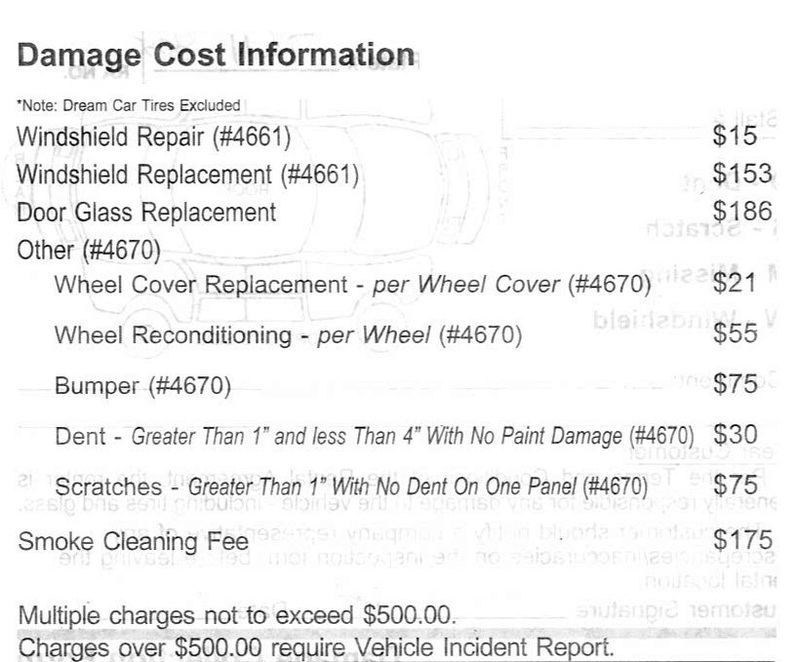 My contract had a list, much like a menu, telling me how much I’d be charged for each type of damage, and clearly stated that they would not wait for 3rd party reimbursement. If you’re not comfortable with that, you should consider taking the coverage offered to you by the rental car company. Know your contract part 2. These days most rental car companies will make you responsible for the down time to repair a car which you return with damage while they cannot rent it. While your insurance policy will pay to repair the rental car, it will not pay for the loss of use while it is being repaired. If you are concerned about this, you should consider taking the coverage offered to you by the rental car company. Always review your personal auto policy with your insurance agent before your trip. Talk to him or her about your trip, who will be driving the car, and where it will be driven. Not all policies extend coverage in this way so checking with your agent before you go is crucial. Rental car contracts vary by company and are ever changing. Unfortunately your insurance agent cannot be there at the time you rent the car to review it with you. Ultimately you must make the decision at the counter when you rent a vehicle. Contact us if you have any questions at 925.737.1560.